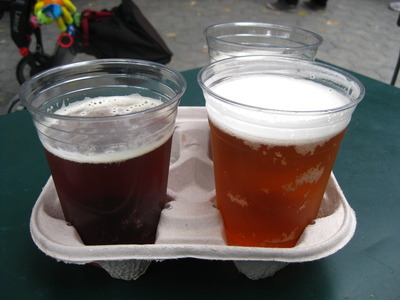 At Madison Square Park, TC and Krista both got the pumpkin beer, which they seemed to like. I opted for the … crap, I don’t remember. It’s the one on the left and was on the special menu though. (I told you this is not a good post… I’ve been drinking and it’s late.) 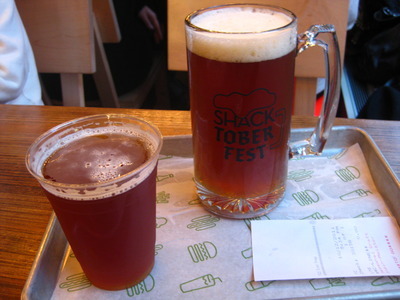 Unfortunately, we’d actually visited Shake Shack for the steins, and they were out! So after bidding Krista farewell – she had papers to write – TC and I walked from Madison Square Park to the Times Square location, where he snagged the second to last stein! Yay! Here I ordered the Kelso Kellerfest seasonal that Beer Boor wrote about last year and found it pleasant enough to drink. We hung out chatting for a while, until other friends joined us and we just chilled – Cheese received the last stein! yay! – and it was good. Very good and fun. Mr. Monster Sweet Tooth ordered the Great White Way concrete,which he graciously let me try. 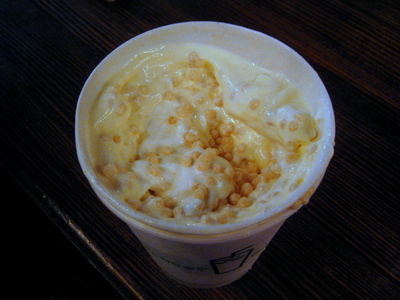 Vanilla custard with marshmallow topping and vanilla crunchies… this was really good! I thought it might be weird because the name skeeved me, but it was actually quite yummy. I might order this again. If I don’t get caught up in the flavor of the day as I usually do 🙂 Note that this concrete is only available at the Times Square location! First beer was Fire Island Pumpkin Ale for my bud and I.
I believe you had the the Shackmeister Ale. You had me pick whichever since there was no Kelso at the MSP location. A stein for me at the 2nd SS pf that night. Victory!! The concrete was okay. I do prefer the chocolatier ones I’ve had before.